A complete step by step tutorial on Introduction to Arduino Zero. Hello friends, I hope you are all fine will be doing something interesting in your life. 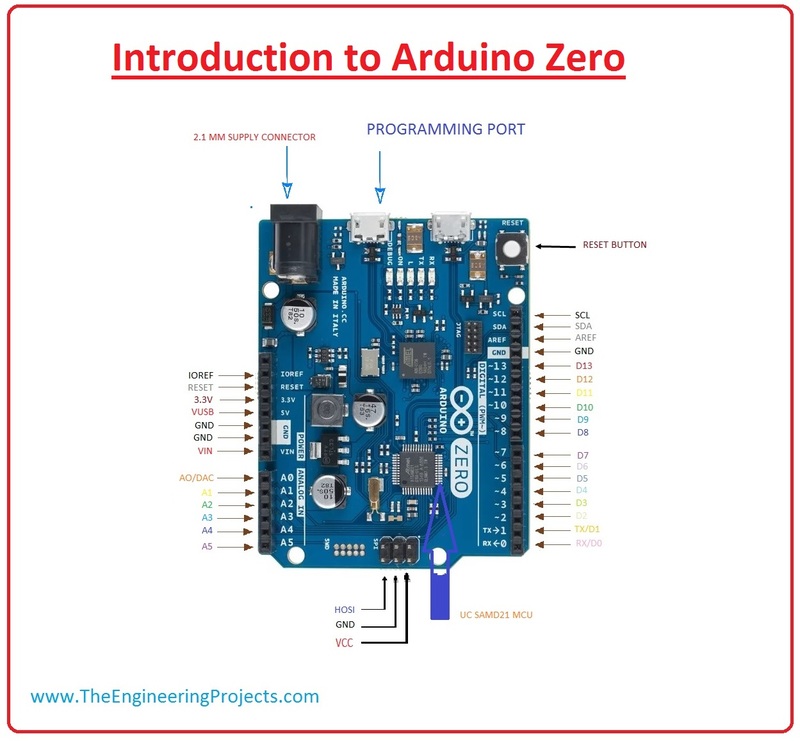 In today’s tutorial, we are gonna have a look at detailed Introduction to Arduino Zero. 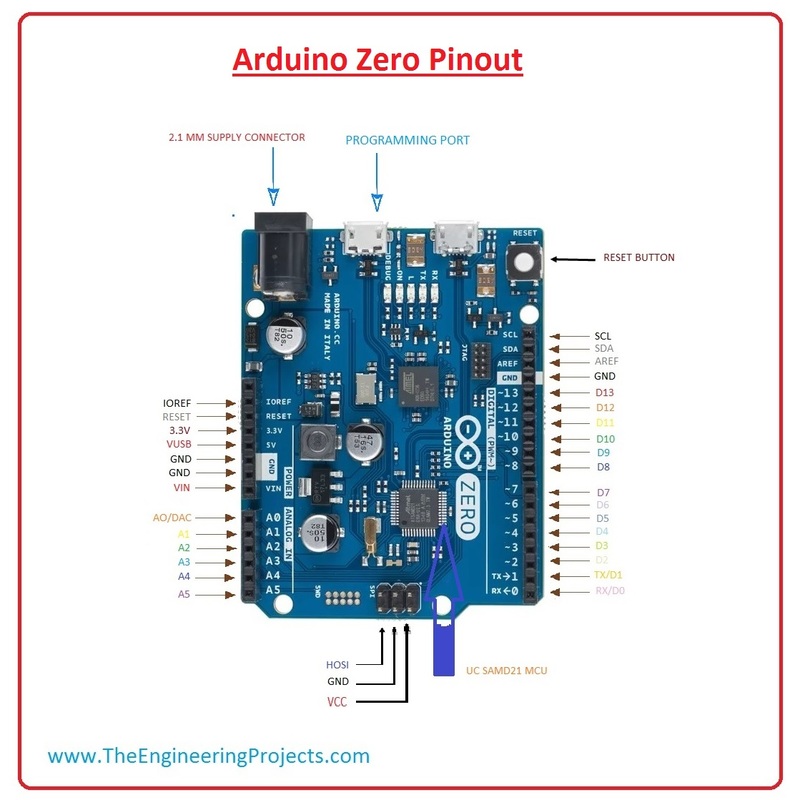 Arduino Zero is a Microcontroller device. It is a 32-bit extension of UNO series. Its main features are Atmel Embedded Debugger (EDBG), it provides a full debug interface without additional hardware. This board provides a platform of new inventory projects in smart IoT devices, high technology automation, robotics and much more. As, Electronic devices coming in our life, they have become cheaper and performing more functions then there predecessor. The microcontroller was introduced in the industry to make our task easy in electronic devices and projects. Arduino Zero is a valuable addition in the electronics industry. It providing the improvement in Arduino role in our projects. In today’s I will explain about Its pinout, projects, working, protocol, etc. So let’s started with Introduction to Arduino Zero. Arduino Zero is a microcontroller board, based on Atmel SAMD21G18U ARM CORTEX MO+CPU. It is simply a 32 bit extension of Arduino UNO series. It has 20 input-output pins (10 can be used PWM output), it also has six analog inputs, 2 UARTs, 48 MHZ clocks, 1 digital to analog converter (DAC), one SPI reader, one TWI and reset button. One of the most important functions of it is that (EDGB), Which provide full debugging without any external hardware. EDGB also support a virtual com port that can be used for boat loader programming. It allows the designer to control electronic devices in a comprehensive way. AC to DC adopter can also be used to power the board. It can operate on external supply 6 to 20 volts. But if we supply below six volts it becomes unstable and if the voltage is greater then 12, the voltage regulator is overheating and may damage the board. There are main twenty pinouts of Arduino Zero, let’s discuss which are most important and mostly used. 01 SCL SCL is a clock line. It uses to synchronized data on a protocol which it uses. It works on the I2C protocol. 02 SDA SDA is a line at which data is transferred by the serial way. 03 AREF AREF stand for Analogue reference. It used to supply Arduino reference voltage. 04 GND This pin is used for ground purposes. 05 TX/D1 This pin used for transmission of data. 07 AD0 It used for analog to digital conversion. 08 IOREF This pin is used for input, output voltage reference purpose. For example, an Arduino would supply 5 v to this pin, but a due would supply 3.3 v. Sending a signal to this pin does nothing. 09 3.3 V This pin is used for 3.3 v supply to Arduino. 10 REST This pin is used for resting of Arduino. 11 VUSB This is a USB port. 12 VIN At this pin, we supply input voltage to Arduino. 13 AO/DAC This is used for analog to digital conversion of the signal. 15 PROGRAMMING PORT This pin is used for the feeding of programming to Arduino. 16 SUPPLY CONNECTOR This pin is used for 2.1 mm supply connector. 17 MCU This pin is used to interface other microcontrollers with Arduino. Now, Let’s discuss the specifications of Arduino Zero. Arduino Zero is a SAMD 21 Cortex M0+ 32bit low power ARM microcontroller. Its board Power Supply (usb.in) is 5 volts. DC current we can apply at the 3.3v pin is 600 mA. DC current for the 5-volt pin is 600mA. Its circuit operating Voltage is 3.3V. Total digital input and output pins are 22. Its PWM Pins are 12 (0, 1, 2, 3, 4, 5, 6, 7, 8, 10, A3 – or 18 -, A4 -or 19). It’s flash memory is 256 KB. It has flash memory for boot-loader is 8 kb. It has SRAM of 32 KB. Its Clock Speed is 32.768 kHz (RTC), 48 MHz. Its supported battery is Li-Po single cell, 3.7 V, 700 mAh minimum. It’s Analog Output Pins are 1 to 10-bit DAC. There is no use of EEPROM. Its LED BUILTIN is at pin no 13. 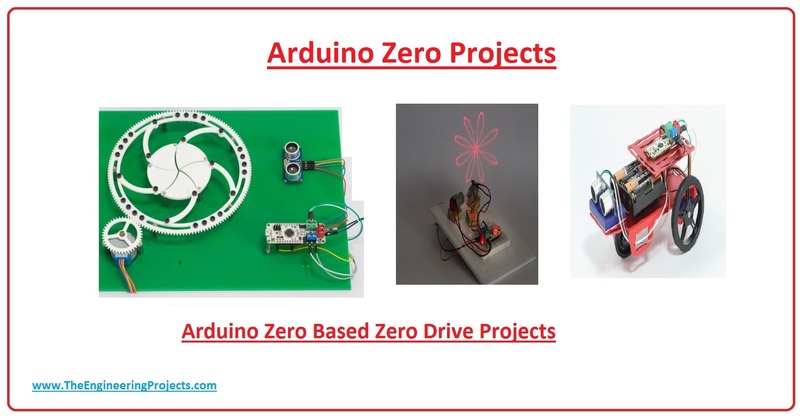 For a better understanding of Arduino Zero, we discuss its use in project By an example. Lets discuss project of Arduino Zero. Zero Driver is basically an Arduino Zero compatible dual motor driver board for mechatronics engineering projects and different types of industrial robots. In robotic projects required two board, one is a microcontroller and other is a separate driver for a motor. Zero Driver combines both in one for our convenience. Zero drivers come with the same microcontroller as an Arduino Zero 48 MHZ ARM cortex M0+ chip, which is better than any other an entry-level Arduino Uno. For better understand how this work lets see a picture of zero drive. These are some applications of Arduino Zero. We can use it as a parking Lot Counter. It can be used in security and Defense System. It is used in Digital Electronics and Robotics. It is used in Weighing Machines. It is used in Traffic Light Count Down Timer. we can also use it in Medical Instrument. It is also used in Emergency Light for Railways. It is also used in Home Automation.